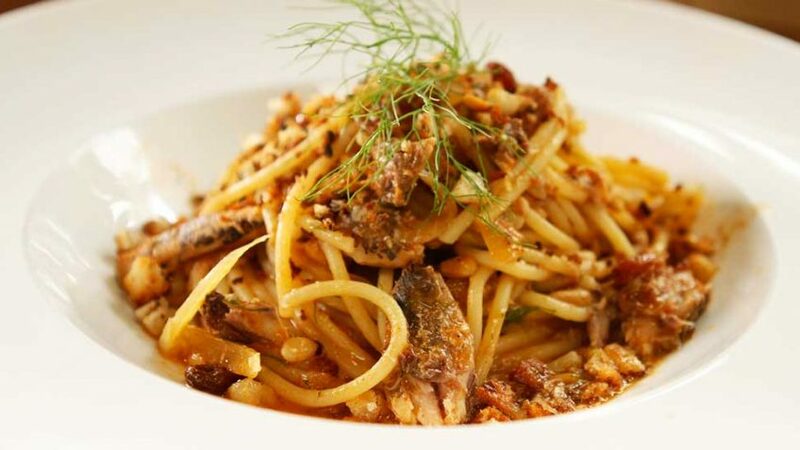 A classic Sicilian pasta dish that can be made with fresh or canned sardines. As canned is far easier to obtain, I chose that option. It’s different from traditional pasta as it seems to be influenced by Arabic flavours, using saffron and raisins. Because of the saltiness of the anchovies, the pops of sweet raisins and the aroma of saffron, this pasta dish truly stands out on its own. Topped with crunchy toasted pine nuts and coarse fried breadcrumbs, I was amazed how the marriage of these combined textures and flavours made this dish dance on my palate. There’s a few extra steps but well worth it, and it’s quite simple to make. Remove one layer of any coarse old leaves from the outside of the fennel. Cut of the tops away from the bulb. Keep the green parts for later. Slice bulb in half, remove the stem and finely slice. Keep aside. Peel the onion, cut in half and finely slice, keep aside. If you have any stale bread, slice it up, break it up and whiz it in a food processor until you have a very coarse crumb. You can also use fresh bread. Add olive oil to a frying pan on full heat, add the bread crumbs and fry until golden brown. Keep tossing or stirring continuously, should only take a few minutes. Pour in container and set aside. Wipe pan clean for next step. Place the same pan back on full heat, add your pine nuts and toast them dry. Keep tossing them until golden brown. Pour in container and set aside. Wipe frying pan clean for later. Take a pinch of saffron threads and add them to some fresh water. Approx one quarter cup. Stir and set aside for later. If your water is boiling, add enough salt to season and place your pasta in the boiling water. See direction on packet, but cook al dente, approx 14 -16 minutes. This gives you time to make the sauce. Take the same frying pan, add two tbsp of olive oil, the chili, and onion, sweat for 1 minute. Add the sliced fennel and mince one clove of garlic. Sweat for 5 minutes until just starting to brown. Add the anchovies (lightly crush them up in pan) , the white wine, saffron water, tomato paste and 2 or 3 ladles of pasta water (one ladle = approx half cup). Add the raisins and leave to simmer for 10 minutes. Open up you can of sardines, drain the olive oil, crush them a little and add to the sauce. Drain and add the pasta and mix well. Add the toasted pine nuts, chop a few green fennel leaves and add to pasta. Place on heated serving plate and top with toasted breadcrumbs and garnish with a few fennel leaves. You can use fresh sardines, simply coat opened fillets in flour and fry in hot olive oil with seasoning.